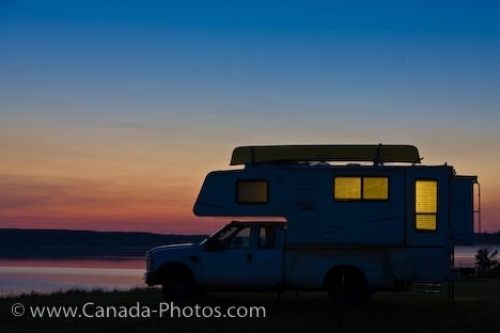 Many of the camping areas at Lake Audy in Riding Mountain National Park in Manitoba, Canada are situated along the lakeshore where you can watch a picturesque sunset take over the sky. The lights from a camper are glowing through the windows as darkness slowly moves in over the area. This campground is very small and peaceful which many visitors on vacation are looking for, but there are limitations on the luxuries. Most people who come camping to Lake Audy only require the luxuries of nature like that of a colorful sunset which highlights the sky and reflects off the surface of Lake Audy. Picture of an array of colors at sunset while camping at Lake Audy in Riding Mountain National Park in Manitoba, Canada.